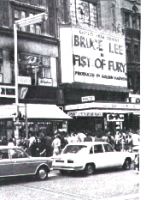 All of Bruce Lee's life was dedicated to the perfection of himself as a fighting machine. Coming from a theatrical background and one in which poverty was unknown, the ability to fight and the confidence to deal with people must have made him very sure of himself. Other stars, through their good looks or talent or both, seem to relax once they have made the top. They no longer need to fight and claw to get the parts they need at the price they want to be paid. But with Bruce it was different. Maybe, as he said, it was because to young people anxious to prove themselves, he was like the ace gunfighters of old who were always having to face the chalenge of some hot head out to make a name for himself. Yet tough guy Humphrey Bogart had the same problem and answered it by always remaining seated. He said nobody could look tough if they hit you while you were sitting down. Robert Mitchum, on the other hand, simply left the bar, or wherever, when anybody wanted to take a punch at him. Why couldn't Bruce Lee have done the same thing? I think it was because he came to films after he had learned to be a true Master of the martial arts. He wasn't somebody who was acting a part, he could really do it. This made him not only a target for fighting fools but also put him on his mettle to show he was no phoney. There is a difference, though, between you can do a thing, and the whole world knowing it through the medium of cinema. You could say to yourself: 'The people who matter to me know I am not a phoney.' But as the stupid challenges went on, would that prove to be enough? If it proved not enough, would you plunge into ever more exercise, more tests of strength, more efforts to increase your speed of action and reaction? I think Bruce Lee did. 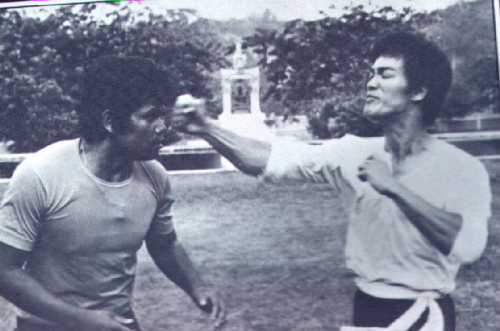 Let us take that famous one inch punch. Karate men say for a punch to be effective, it must travel at least eighteen inches. That is true if only the arm and shoulder weight are being used. But the Chinese, using the reverse power of the chi have been throwing one inch punches for years with great effect. 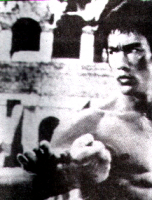 Bruce Lee's punch took its power from the waist. Standing in a Southpaw stance, right foot forward, and facing your opponent, you punch at the same time as moving the body round from the waist till you end up side on to your opponent. It was very effective and he made effective use of it. Yet for a man who was hounded by people issuing challenges to him, he could be provocative himself. The story is that one night at a party, he told a man that he could knock him across the room using only a punch from one inch stance. The fellow guest showed disbelief and did indeed found himself across the room. Now I am not convinced that that was the behaviour of a man who wanted to use his knowledge in order only to put fear out of his mind. In fact, it seems more the behaviour of somebody who feels he has to prove something. Who feels that perhaps other people in other spheres of activity, do not take him seriously. Then there is the story of the one finger press-ups. Perhaps a one finger press-up proves something. It shows, I think, a great control over the mind as well as superior strength and ability to use that strength. Is it worth anything more than that? 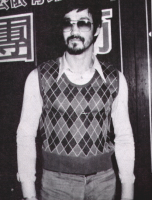 He wasn't a big man, the Chinese are seldom very tall, yet every inch of his frame was a power house of muscle. Muscle, coordination, knowledge and skill, that was his body and it was a peak fighting machine. He was not a weight lifter or a body builder. You have seen that those people can finally become so muscular that they look grotesque. The body becomes distorted as over-developed muscles jostle for a place under the skin. 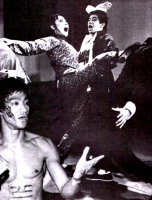 That was not Bruce Lee's body. His muscles were there for a purpose and they functioned properly. He had surely reached the point where he needed only normal gymnastic exercises together with his fighting work-outs to keep himself in prime condition. And so the question which bothers me, and will keep on bothering me, is whether he drove himself on merely because he did not feel as secure in the world of actors as he did in the world of martial artists. 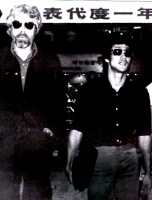 Did he want to be taken seriously in the film world and yet feel that he would not be as long as he made Kung Fu films. If he did, that might be a point of frustration which drove him on and on. He wasn't like some stars who shoot to fame and then waste their newfound riches on wild living and great luxury, or drink too much and drive too fast. He was a family man who enjoyed his family, who enjoyed his friends and who was sensible about his good fortune. The only flaw was the desire to always be the best even when most anyone who could judge these things knew that he was the best. He couldn't say it to them so he went on with his physical exercises. The theories about his death are endless variations on a theme. A fairly likely one is a slowly built up resistance to a drug he was taking which led to a fatal haemorrhage of the brain. It may be so. It may even be that he, like a few unfortunate people, was born with that seed of destruction already within them. Could it be, simply, that he worked himself too hard to prove what others already knew - that he was the best? That he was the King?